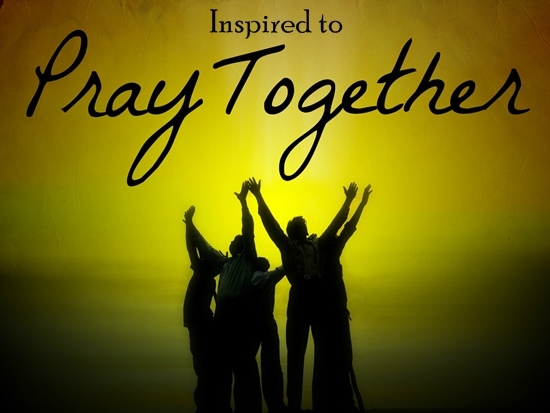 Prayer Warriors who joined the 24 hour Prayer Event: THANK YOU! September 29, 2015 9:08 pm / 2 Comments on Prayer Warriors who joined the 24 hour Prayer Event: THANK YOU! I would like to say a heartfelt thank you for those of you who participated in the 24-hour prayer call. Your prayers called out for Saeed Abedini, his family, and the persecuted church. 350 people came to unite in prayer during the 24 hours of the call. There was much heartfelt prayer and many tears shed. We do believe that God heard and expect that He will act and answer our prayers. For the prayers that were prayed from our hearts were reflecting His heart. The tears that we shed were His tears. Please continue to remember Saeed, his dear wife Naghmeh, and his children Jacob and Rebekka in your prayers. Also please remember the Persecuted Church in your prayers. For Saeed represents those who suffer for Christ around the world. I would like to thank our partner ministries for helping to put this call on. For one ministry alone could not have pulled this off. And most importantly, I would like to thank the Lord Jesus Christ who showed up mightily on our call. For were He not present, this call would have been in vain. Brothers and sisters, much blessings be on you in Jesus. (Voice of the Persecuted) This week, world leaders from across the globe are meeting in the US. Iran & Thailand were topics of discussion that we paid particular attention to. Words from both countries, were carefully orchestrated to show the world that they were deserving of new positions on the world stage. Both countries are trying to show they are in favor of democracy and freedom, but the actions of both countries tell a different story. Thailand is putting forth that they are caring for migrant workers to keep them from human trafficking. Things are not what it appears on the surface. A world tourism hotspot, Thailand has seen recent numbers falling, and with good reason. They are steeped in human trafficking and human rights abuses. You might recall the Government of Thailand is under great scrutiny as investigations have implicated Thai state officials and many others for their involvement in human trafficking networks. Thailand is not the sole purpose of this report, but a huge factor. They are arresting Christians fleeing persecution in Pakistan. Christians who are not ‘economic refugees but bonafide persecuted. These Christians escape to Thailand because visa’s can be easily obtained and is economically easier for them to travel there. They’re seeking religious freedom without fear of being abused or killed for their faith in Christ. Upon arrival, they immediately apply with the UNHCR for asylum. They’re given asylum seeker certificates and interview dates, but Asylum seekers in Thailand normally wait up to 3 1/2 years or longer for their cases to be processed by the UNHCR office. Thailand does not have a working relationship with the UNHCR and refuses to recognize the valid documents given to these asylees. 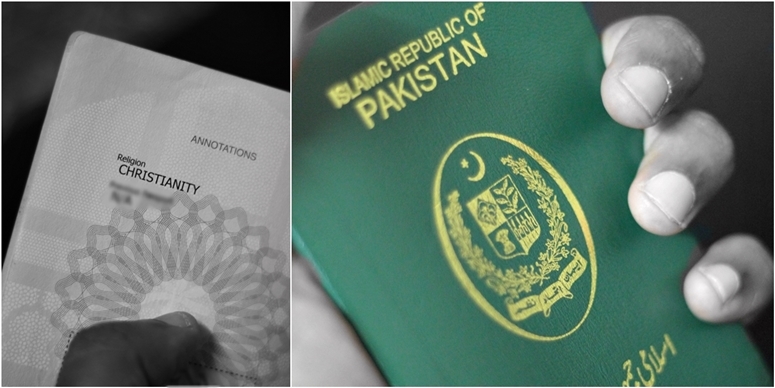 Most are financially unable to continually renew their visas. When the asylees travel visas expires, normally 6 months, they become illegals in the eyes of the Thai government. They come trusting the UNHCR for protection, but soon find the organization powerless in Thailand. Adding to their stress, waiting periods of mere months between applying for refugee status and their Refugee Status Determination (RSD) interview now see extremely long delays. When an interview dates approaches, the UNHCR office often postpones them another year. This was recently the case of one who was nearly assassinated multiple times in Pakistan. They’re also not allowed a work permit without status. If found in the labor force, they will be arrested. If caught as an illegal, they are detained in the inhumane conditions of the Immigration Detention Centre (IDC). Recently authorities began penalizing them under the criminal penal law of Thailand. Many have been incarcerated together with criminals in the Central Jail, with no exceptions or special treatment provided to women or children. These Christians are at risk of being sent back to Pakistan, putting them in grave danger. Delays and the inability of the UNHCR to work with the Thai government for their protection, leaves them vulnerable to abuse, extortion and bribery, and extended suffering as they wait in hiding. The global community, world leaders and the UN body are mainly silent on the targeting of these Pakistani Christians. We hear many heartbreaking stories during interviews with these refugee’s. Threatened with death in their homeland, entire families in danger if they speak out, and no way to support their families in hiding. Pakistan portrays itself to the US and UN as a vital ally in the fight against terrorism—the Taliban. Since 2002, Pakistan has received about $1 billion a year under a U.S. program meant to reimburse it for costs incurred fighting militants near the Afghan border. This year, $1.1 billion. Pakistan is one of the worst persecutors against religious minorities, particularly Christians. The internationally known case of Asia Bibi who maintains she was falsely charged with blasphemy, is currently awaiting an appeal for her death sentence. Her crime? Defiling a well by drinking from it and refusing to convert to Islam. Many Pakistani Muslim’s believe Christians are unclean due to their faith. Even being forced to drink from separate glasses deemed for infidels. The persecution against them can be fierce. “We want freedom!” This cry is heard from many Pakistani Christians who’ve fled extreme abuse. We hear over and over, “I had good job—was well off.” One lamented, “One day a Muslim took offense because I simply asked they use polite language instead of cursing in our presence, then everything changed.” He was then accused of desecrating the Quran on a trumped up charge, simply for demanding they respect and not curse. When a court ruled him innocent, mobs formed and multiple lives were lost, but his was saved. That day changed his life and that of his family forever. It ruined his livelihood, caused so much devastation and suffering for many. This family fled leaving behind shredded dreams, and a life that is only now a distant memory. Forced to live in hiding, squalor and begging for food. Often, Blasphemy charges are wrongfully used against them. They drink from wells that Muslim’s own, and they are attacked for contaminating their water by from drinking from it. Mobs often form, wielding axes, rifles, sticks and stones. Christians are beaten, burned alive, dragged naked through streets, and left for dead. The police rarely interfere and often release the perpetrators with no penalties or accountability. This is not a single incident, it’s widespread and growing. Pakistan’s government is based on religion. A religion, government, justice system and economic system all rolled into one. It’s called Sharia. The religious political party has great influence and seems to supercede any other form of Government. Christians are not instigating violence, rioting, burning or pillaging. They’re conducting business, worship and education and trying to live peaceful lives, just as we are here. But one day hear, “Stop talking about Christ and convert to Islam or be killed.” …their nightmare it begins. Another Pakistani Christian who also had a good job, was fired for his continued belief and sharing the Gospel. He was involved with a mission to reach out to Christians less fortunate and educate them in the Gospel of Christ. He led a Youth Ministry so they would know Christ, the Bible and Christian moral values. He was beaten, told to stop witnessing, convert to Islam or die. His family members also became targets for his Christian activities, which is a common practice by hardliners. These hardliners influenced his employer and he was fired from his job. Prior to the persecution, he’d was a valued employee and excelled at his job for years. He too was forced to leave the country. They repeat, “We’re not beggars, we’re educated, hard working people. Why have they done this to us? We want to work and live in peace, we just want Freedom! How can the church of Christ allow their suffering to continue? Why aren’t we doing more to care for our own? Why do we turn our heads and expect secular governments and organization to come to their rescue? As the church in Germany during the Holocaust, why do we turn up the worship music, so we can’t hear their cries? Not enough churches, or brethren are stepping up for the wounded in the Body. They need our help, our voice. Yes, we are commissioned to spread the Gospel, and we wholeheartedly encourage that mission, but when we turn a blind eye to genocide and suffering of our own brethren, God is not pleased. In fact we are warned about this in Matthew 25. While Christian asylees in Malaysia, Sri Lanka, and Thailand are treated as sub human, ashamed and having to beg for housing, and food from whomever will hear them. Well, I too will beg for them, their support and their human rights. They tell us some groups sensationalize their stories, even making money from their reports and in so doing feed off the backs of the persecuted and even putting them in danger for mentioning their names and locations. They make promises, but they see little to no help. This is appalling and it’s appalling to them. We are the church, we are the body of Christ, and we are failing our brethren miserably. We are failing to care for own. Even failing to pray! Recently an advocate asked a pastor if his church prayed for the persecuted. His reply, “We’re not led in that direction.” We’ve also heard, “it’s not an easy topic to discuss, they may run for the hills.” Having a heart for the persecuted, we can’t help but feel this is blatantly ignoring the commands of Jesus to care for one another. In conversations with Christians, it’s shocking how many don’t know that Christians are being persecuted in these times, even with all the media coverage. Often, they ask many questions and want to know more. We ask if they would like to hear more about these cases from their pastors and pray together for them. They always say YES! Please, start a conversation, ask your church why they are not covering persecution and attempting to aid our brethren. Many churches have wonderful mission for the communities—food shelves, thrift stores and other programs. But why not once a month donating pocket change to help our brethren in Thailand, Sri Lanka, Malaysia, Pakistan, Nigeria and around the globe? Why not engage with them in letters, on facebook, or any form of social media. This is their life line. Why not, speak out for them, why not encourage them, why not pray for them? Why not indeed. I’m begging you to help in whatever way you can. God will lay on your heart what you can do. Not everyone has money, but you have time, you have words, you can speak. Beg for them, pray for them, encourage others to pray with you. Demand that our politicians recognize the Christian genocide and help those seeking FREEDOM! God will bless you for taking up this cause. Together with your generous support, we can reach the goal to alleviate horrific suffering. In darkness and desperation, let us serve in love, with open arms and giving hands to provide light and hope. Everyday, we thank God that He is working through you to care for His children and further His Kingdom! As you greatly bless others, may God continue to bless you. Thank you so much for your support. We couldn’t do it without you! Naghmeh Abedini thanks prayer vigil participants and shares an inspiring message. Nigeria (Morning Star News) – Authorities declined to acknowledge that Muslim Fulani herdsmen were behind a rash of attacks on Christian communities in Plateau state last week that took 38 lives and displaced 5,000 people, area sources said. More than 100 armed Muslim Fulani herdsmen at about 2 a.m. on Wednesday (Sept. 16) attacked the Christian community of Kadunung, in the Mangu Local Government Area (LGA), killing 18 Christians and sending 5,000 running for their lives, according to witnesses, though authorities did not identify the assailants as Muslim Fulanis in an effort to quell ethnic and religious violence. About 150 houses were destroyed in the attack and 18 corpses recovered and buried, while the injured were taken to the Plateau State Specialist Hospital, Jos, said Titus Bise, chairman of the Mangu Local Government Council, in a press statement. The 5,000 displaced residents of the village constitute a serious humanitarian problem, he said. Charles Matoh, a Christian community leader in nearby Gindiri, said by phone many of the displaced are taking refuge there. “Many people have been killed, and among them is a man and his six children,” Matoh said. The Rev. Dacholom Datiri, president of the Church of Christ in Nations (COCIN), told Morning Star News that in spite of pleas from the church to the Nigerian government, such killings have continued unabated. In Foron and Fan districts in the Barkin Ladi LGA, armed Muslim Fulanis attacked seven Christian communities on Sept. 14 at about 1 a.m., killing 17 Christians; three others later died in the hospital from bullet wounds, area sources said. Local resident James Pam told Morning Star News by phone that the attack occurred between 1 a.m. and 4 a.m.
Datiri of the COCIN said all 20 of the dead were members of his church. Istifanus Gyang, a member of the parliament in the Plateau State House of Assembly, confirmed the killings while speaking to journalists in Jos on Sept. 14. Muslim Fulani herdsmen also launched attacks last week in Taraba State in northeast Nigeria. In the Christian community of Sarkin Kudu in the Ibi LGA, nine Christians were killed on Sept. 15, said the Rev. Caleb Ahema, President of the Christian Reformed Church of Nigeria (CRCN). The attack on Sarkin Kudu occurred at about 3 a.m. and resulted in the wounding of most of the village’s women and children. “The attack on Sarkin Kudu is a continuation of the systematic attacks by the Fulani herdsmen on Christian communities in this area, where many have been killed and many more displaced,” Ahema said. The victims of the attack were all members of the Universal Reformed Church (NKST), said Ahema, who is also the chairperson of the area Christian Association of Nigeria (CAN). Local church leaders have said in recent months that more than 200,000 Christians have been displaced from the area after their houses were burned down. Joseph Kwaji, police public relations officer in the state, confirmed the attack on Sarkin Kudu town and the murder of the nine Christians. “Nine persons were killed there, but we are still investigating the incident,” Kwaji told Morning Star News by phone. He added that an undisclosed number of people were wounded in the attack. Last month in In Nasarawa state, armed Muslim Fulani herdsmen in Kofar Gwari village of Kokona LGA on Aug. 16 killed two Christians and injured many others. Reports from church leaders in the state show the assailants invaded as Christians were preparing to attend morning worship services. The dead were identified as Yaweh Oshawu and Idi Ibrahim, both members of the Evangelical Church Winning All (ECWA). Among the injured was church member Safiyanu Maidoki and an unidentified pastor. Bishop Joseph Masin, chairperson of the Christian Association of Nigeria (CAN), Nasarawa state chapter, told Morning Star News that there has been a series of such attacks on Christian communities in the state over the years. “Christian communities in Nasarawa state are facing severe persecution now more than at any other time history,” said Masin, who is also bishop of the Word of God Ministries, Lafia. Ismaila Numan, police public relations officer, Nasarawa State Command, told Morning Star News that an investigation was underway. (Voice of the persecuted) Maiduguri, the capital of the Nigerian State of Borno, was hit by new attacks committed by Boko Haram on Sunday, September 20th. According to varying reports, between 54 to over 100 people were killed. Despite this, the inhabitants of the city who decided to escape the violence, are now returning. In an earlier interview with Vatican Radios English Service for Africa, Fr. Obasogie said “Most of our people are coming back to their communities”. Many towns, homes, schools, hospitals, bridges have been razed down by the bombs of Boko Haram. Generally life and movement in this part of Nigeria has been very difficult. “A lot of our people are back, but they look sick, hungry and traumatised. “These communities need support. The Bishop of Maiduguri, Oliver Dashe Doeme, has taken the unusual step of sending priests to these same communities where security is far from certain. He wants the priests to accompany the people as they try to rebuild their lives”. The ordination of three new priests in one of the communities that was bombed and ransacked by Boko Haram was a sign of hope. Despite fears of new attacks, the faithful who even come from distant places of the diocese went to the ordination Mass. Fr. Obasogie says that against all odds, “The faith of the Church in this part of the country is truly growing. 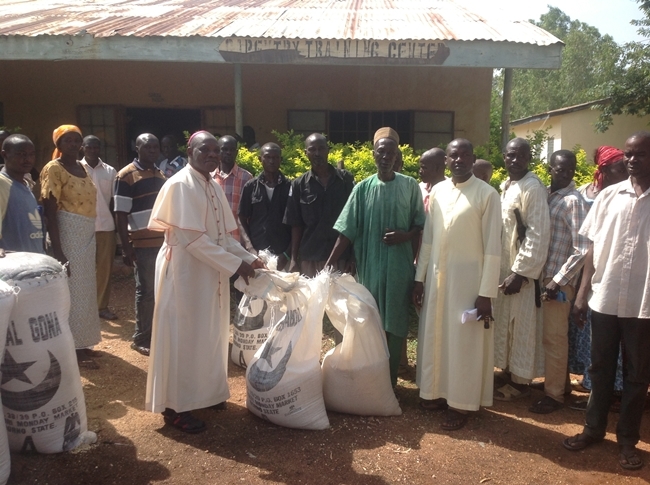 We appreciate all people of good will who have demonstrated their love and care towards the suffering Church of Maiduguri Diocese. Our people have come to experience greater faith than ever before. They hold on to their faith in their plight and difficulties. God is all we have now,” he emphasised. He also relayed, “the Buhari administration is doing its best to end the insurgency. The military is advancing and recapturing those communities that were under the terrorists’ control. Despite this, a lot of people are still afraid of the presence of suicide bombers around the city and villages”. Due to conflict, particularly in the north east by the Boko Haram insurgency, the humanitarian situation has become dire. The needed counter-insurgency has added to and may further increase the numbers of displaced people. Many husbands, wives and children have been separated unable to locate and unaware of their loved ones condition. Humanitarian needs are great. The displaced in the camp that Voice of the Persecuted is aiding has doubled in the last few months. There are many staying here who are unable to return to their completely razed villages, or areas still at risk of attacks. Recently, deaths have been reported from a cholera outbreak at three nearby camps in the area. We thank God to report none at our camp were affected by the outbreak! To lessen the chance of disease, sanitation safeguards had been put in place and much effort made to keep the camp clean. We invite you to rejoice with us for the gift of life, new babies born at the camp! Raise these little ones up to the Lord, along with their families, the road ahead may be long and hard. On 22 September 2013, a twin suicide bomb attack took place at All Saints Church in Peshawar, Pakistan, in which 127 people were killed and over 250 injured. It was the deadliest attack on the Christian minority in the history of Pakistan. (Morning Star News) – Three men beat and raped a 19-year-old Catholic woman in Uganda last week, sources said. The student at St. Mary’s Teachers College in Bukedea, in the district of the same name about 50 miles from Mbale in Eastern Uganda, said she was returning from class on Sept. 9 when she was ambushed by three masked men who indicated they knew that her parents had left Islam. Instead of killing her, they raped and beat her so severely that she is still receiving hospital treatment for her injuries, sources said. The men attacked her seven miles outside of Mbale on Kumi Road and dragged her about 100 meters off the footpath, she said. After beating her until she was unconscious, they left her to die near a swamp. Area resident James Kalanga found her early the next morning, Sept. 10. The three men went back into the wilderness and found her half-naked and groaning in pain, still unable to speak, he said. Nearby they found her school backpack; they opened it and discovered her name and school, he said. They took her to a medical clinic and reported the matter to the school. 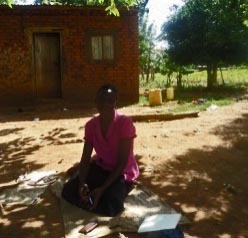 The school informed her parents, who went to the clinic and then took her to a hospital for treatment. The family left Islam five years ago and joined Bulefe Catholic Church. In an undisclosed village in Budaka District, also in eastern Uganda, a 36-year-old mother of eight requested prayer after area Muslims forced her to return to Islam, she said. Madina (full name withheld) said she maintained her faith in Christ in spite of her husband leaving her 10 years ago because she became a Christian, but that she returned to Islam this month after her former in-laws threatened her. Madina told Morning Star News she is spiritually troubled from returning to Islam, and she asked for prayer that God would supernaturally restore her to Christ. “The family of my husband had cut all ties with me when they discovered that I joined Christianity, but this was not much of a problem to me as compared with the death threats that they have issued,” she said. (Morning Star News) – A pastor in northern Laos who disregarded officials’ orders to stop preaching Christ has been stabbed to death, sources said. A prison official identified only as Wansai entered the home of pastor Singkeaw Wongkongpheng in Na-ang village, Chomphet District, Luang Prabang Province on the night of Sept. 8, relatives told advocacy group Human Rights Watch for Lao Religious Freedom (HRWLRF). While four other unidentified men who accompanied Wansai waited outside the pastor’s home, Wansai entered shortly after 10 p.m. and first grabbed Pastor Wongkongpheng’s wife. When the pastor came to help her, Wansai tried to take him away, according to HRWLRF. 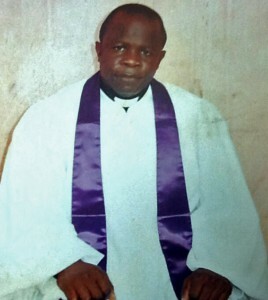 The pastor called out for help, and Wansai stabbed him three times in the back, according to HRWLRF. Pastor Singkeaw’s son, identified only as Manh, arrived and chased Wansai as he fled, severely injuring the assailant, witnesses said. As Wansai received treatment at a hospital, relatives of the slain pastor learned that Wansai is a Luang Prabang provincial police serving as a prison guard in Pha-Oh Prison. The HRWLRF director (name withheld for security reasons) said area Christians believe the killing was the direct result of the pastor’s refusal to stop speaking of Christ. Area Christians in Luang Prabang, a northern province bordering Vietnam, suspected the five men meant to abduct and kill the couple in the same way that a pastor and his wife in Luang Namtha Province were slain several years ago, he said; their bodies were never found. Officials had ordered Pastor Singkeaw to stop spreading Christianity a few years ago. The history of orders for him to cease preaching Christ began in 2000, during a period of severe persecution of Christians in Luang Prabang Province from 1997 to 2002, the director said. Lao officials delivered orders that no Christians be allowed to spread the Christian faith in Chomphet District and many other districts in Luang Prabang Province. Pastor Singkeaw’s Na-ang Church in Na-ang village has 58 members, with some coming from Hueytat village in the same district. A local Christian leader reported that Pastor Singkeaw was a law-abiding citizen who lived a simple life with very little material goods. He had no enemies, nor had he received death threats. 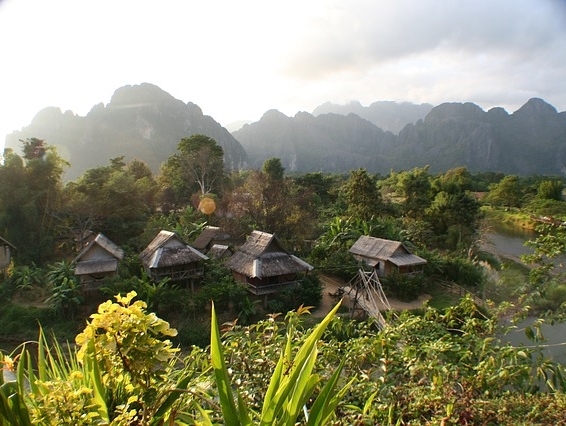 Christians in Laos are frequent targets of harassment by communist officials, Buddhist leaders or animist villagers. Buddhists make up more than 57 percent of the population of the Communist country, according to Operation World. About 35 percent of the population adheres to indigenous religions, and only 3.4 percent of the population is Christian. “The HRWLRF is calling upon the Lao government to investigate into the death of Pastor Singkeaw and bring justice to his family and church as well as to hold the police officer and four other unidentified attackers responsible for their cruel and cold-blooded murder,” the director said. The group is also urging the Lao government to respect religious freedom as guaranteed in the Lao constitution and the U.N. International Covenant on Civil and Political Rights, ratified by Laos in 2009. The covenant upholds the individual’s right to adopt a religion/belief of choice as well as the right to manifest that religion/belief in a corporate worship (Article 18). “Any form of coercion impairing the freedom to have and manifest one’s religion/belief of choice is condemned in the covenant,” the director said. In Savannakhet Province, a pastor and four other church leaders who were convicted in February of being “illegal doctors” because they prayed for a sick woman who later died have been freed pending outcome of their appeal. The People’s Court of Savannakhet Province on Feb. 12 sentenced the five Christians to nine months in prison and a fine of 500,000 kips (US$62) each. In addition, the defendants are to jointly pay 20 million kips (US$2,448) in emotional damages and funeral costs to the family of the deceased, according to court records. The woman who died, identified only as Chansee (also known as Chan), had been ill for two years with an unknown condition. Various kinds of healers and doctors in Saisomboon village, Atsaphangthong District, had treated her without success, area residents told a representative of HRWLRF. Held in stocks after their arrest in June 2014, the Christians – female pastor Kaithong Khounphaisane and four leaders of other churches identified in court records as Phouphet, Muk, Hatsady and Thiang – were released in March and are awaiting the outcome of their appeal.